All my coursemates were finished their viva, I guess this thesis-phobia would come to an end now. What's left now is final and the hard cover of thesis. For those friends who haven't finish their viva, try your best and strike a beautiful presentation, since it will be your very last one in this university. I brought my printed thesis to a shop to make the hard cover, and I got it now, each of us have 2 copies of it. 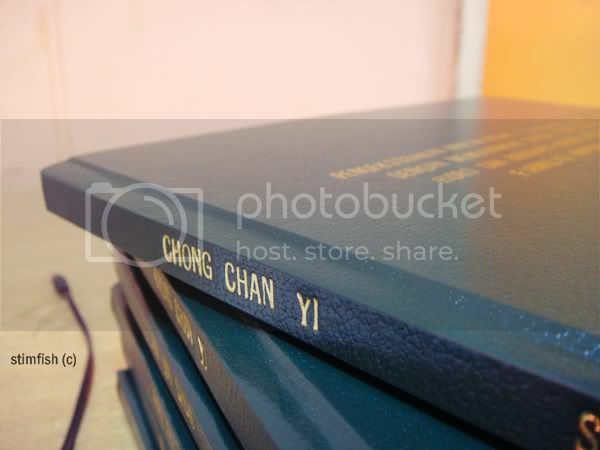 It's so dashing when I see the gold color name of mine printed on the green cover, at least I did something great in these 3 years time, and with no regret. Thinking back my first and second year, I were so active in those societies (not to say I were being forced), quite a good experience for me and I knew lots of friends because of that. Great to know you guys. Sentimental again. You see this? CHONG CHAN YI, lovely. We hold onto things for so long because we're scared something so great won't happen twice.